A properly poured Guinness starts with the perfect glass, a 20 ounce, tulip-shaped pint glass to be exact. You have to tip it at the right angle to allow the thick porter to fill the glass without drowning the beer in froth. Once it’s settled, put your Guinness up to the tap, holding it level, and finish filling the glass with one direct pour. Sip the foam until beer touches your lips. Repeat and enjoy. One could say that Arthur Guinness, the founder and first brewer of the beverage by his same name, was confident that his recipe would take off. He left his first brewery in charge of his brother in 1755 and moved onto a site that he has heard offered a great deal. He signed his flowery signature on the line and agreed to a 9,000-year lease to brew at St. James’ Gate in Dublin in 1759. Originally, Arthur has begun brewing Dublin ale but turned his focus towards the dark porter because of its popularity with the market porters. Arthur’s growing business and growing family (he had 21 children) gained so much popularity that by 1883, the St. James’ Gate Guinness brewery was the largest in Ireland. The St. James’ Gate brewery is now the biggest in the world and a favorite place to visit among tourists. You can tour the entirety of the site, see the originally signed 9,000-year lease, learn about fun Guinness recipes, and enjoy a pint or 2 while overlooking the rolling hills of Dublin. When drinking your Guinness, take exceptional care in the way you enjoy your beverage. Like a fine wine, there is an art to drinking this frother beer that was set in stone centuries ago. 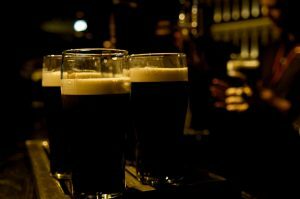 Grab your Guinness firmly, and gulp down at least a quarter of the beer as if it were the first drink you had all day. Enjoy the rest in 3-5 more gulps, and prominently display your frothy mustache to the rest of the pub. Sláinte! Experience All of This and More on Our NEW Tour of Ireland! Taste authentic Guinness and see the storybook sights of Ireland with us on our Hops, Grains & Slainte: Irish Whiskey, Food & Adventure trip! Prepare to open your mind and your taste buds while traveling along the southern coast of Ireland from Dingle to Dublin. This journey is filled with behind-the-scenes glimpses, sights you’ll never forget, and plenty of knowledge. Don’t wait, come with us on the trip of a lifetime. Sláinte! If you have any questions or want help booking your Ireland adventure, please contact AESU by calling 800-638-7640, or fill out the contact form found on our website. This entry was posted on Wednesday, March 15th, 2017	at 1:36 pm	. You can follow any responses to this entry through the RSS 2.0	feed. Both comments and pings are currently closed.